A utility knife are cutting tools used in various trades and crafts for a range of purposes. Designed to be lightweight and easy to carry and use, utility knives are commonly used in factories, warehouses, and other situations where a tool is routinely needed to open boxes, packages, or cut through tape or cord. At The Razor Blade Company you can choose from retractable blade utility knives or a fixed blade utility knife. The retractable utility blade like our 66-0358 is designed to be safe, ergonomic and reduce damaged product with its enclosed cutting head design. The variable blade exposure lets you chose how far you need the blade to retract so you have more control of the knife. The 65-0200 utility knife is our favorite pick of utility knife for its smooth handling and compact closed position. 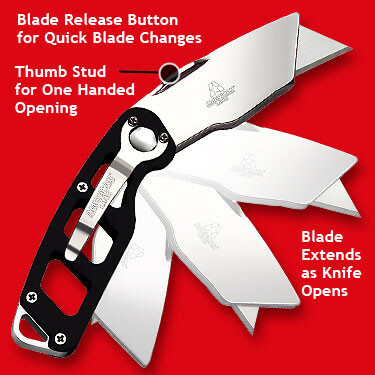 It has a useful blade release button for fast blade change, and an easy load feature that requires no tools to change blades. Many of these utility knives have refillable dispensers that can hold up to 5 extra blades. Easy for carrying around in your pocket, the uses for a utility knife are endless. The fixed blade version of our utility knives, our 61-0476 utility knife is widely used for handcrafts and model making and is best suited for cutting thin, lightweight materials. More often the specialized handle and blade allows for cuts requiring a high degree of precision and control.